Popcorn is a favorite snack at our house, especially for my little boy. 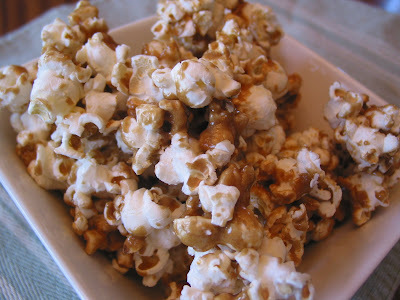 Every once in a while we make caramel popcorn for a special treat. We usually have to share it with our friends and neighbors otherwise I would mostly likely eat most of it myself. It's a little addicting, but yummy! Bring butter, brown sugar, corn syrup, and salt to a boil, mixing well. Continue boiling (over med - med high heat) for 5 minutes, stirring constantly. Take off heat and mix in vanilla and soda. Pour over each bowl of popcorn and mix well. Spread onto 2 cookie sheets. Bake at 225 for 1 hour, stirring every 15 minutes. Enjoy!